A year after suffering the tsunami inundation that led to an unprecedented triple meltdown, stabilisation and restoration work continues across the entire Fukushima Daiichi power plant site. The most important task - stably cooling the reactors and the used fuel pools - was achieved many months ago and temperatures there remain low. Sensors in the bottoms of the reactor vessels show units 1, 2 and 3 to be in the range of 25-60ºC. One of three sensors at unit 2 malfunctioned a month ago and Tokyo Electric Power Company (Tepco) is investigating how it can install a substitute to maintain diversity of data sources. The used fuel storage ponds are also cool, and in fact cold weather has presented more of a problem to Tepco in recent weeks. The company has taken steps to insulate cooling equipment to prevent minor pipe-breaks. With essential nuclear safety secured, the focus for this phase of the restoration is to prepare for major projects such as the removal of used fuel from the ponds and the ultimate removal of the melted remains of the reactor cores. 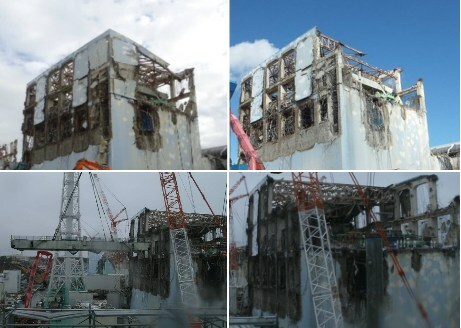 The most damaged buildings are units 3 and 4, and Tepco has worked to remove large pieces of rubble as well as sections of concrete and steel from the building tops - above the used fuel ponds on the service floor level. Using a plumb line, Tepco has established that unit 4 pool water has visibility to a depth of about five metres and it is now planning to remotely inspect the pool and ascertain the extent of rubble within it. At unit 2, whose building remains intact, robot-mounted cameras have surveyed the service floor, recording radiation levels. It's not thought that any of the used fuel has suffered damage. Before the used fuel can be removed from the ponds, it needs a safe and secure place to go. Towards that end, Tepco is restoring functionality to some damaged sytems at the common fuel pond, which holds historic fuel from all six reactor units at the site. The overhead crane was brought back into operation at the end of January and its full suite of power systems should be repaired by April, the company said. The most difficult task ahead is the ultimate removal of the reactor cores. This requires decontamination within the buildings of units 1, 2 and 3 as well as certain repairs to the primary containment vessels. Investigations are starting to find the best way to survey within the containment and a second endoscopic inspection is planned. Tepco said that cooling water is leaking between buildings from some flaws in the primary containments, and the company is testing a method that promises to fix the issue. Efforts are also underway to suppress inflow of groundwater into the turbine buildings, as this increases the task of managing the water accumulating in the building basements. For personnel on the site Tepco announced some changes to working procedures. Dust-filter masks instead of charcoal filter versions are to be worn for outside work, while the use of a Tyvek uniform is no longer required for certain routes between buildings. The company aims to clean up the main anti-earthquake building so it can be used without protective equipment. The floor and walls will be covered with lead plates and efforts to decontaminate the car park area have been effective. 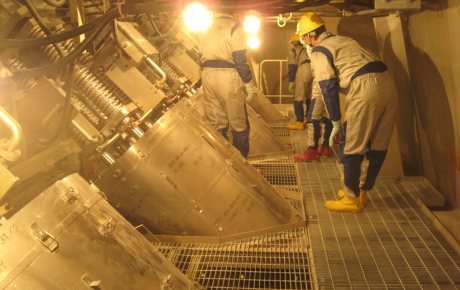 As fast as Tepco is injecting water to cool the reactors, it is emerging from the damaged reactor pressure vessels and accumulating in a body stretching through each unit's reactor building and turbine building basement. Although this water is highly radioactive, it is being purified at the same rate and then stored on-site in ever-increasing volumes. Despite being more than clean enough for discharge, Tepco has never been given permission to release the water into the sea. Currently some 160,000 cubic metres is in storage, tanks, with a further 40,000 cubic metres of capacity planned for installation. The Japan Atomic Energy Agency is currently analysing samples of water both from the basements and after purification, but Tepco is nevertheless considering an Advanced Liquid Processing System that could remove radioactivity in the water still further - even beyond the limit of detectability, it said.